GM Baadur Jobava has won the David Bronstein Chess Memorial 2014 held in Minsk from Feb 11-19. The Belarus Chess Federation organises the event every year. David Bronstein was the former World Chess Championship challenger who nearly dethroned Mikhail Botvinnik in 1951. He was born in 1924 in Ukraine and passed away in 2006 in Minsk. 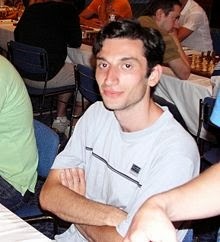 Georgian Grandmaster Baadur Jobava won the tournament after beating Sergey Fedorchuk and Mikhailo Oleksienko (both Ukraine) on tie-break. The three players completed the event with 7,0/9 points each. The Open A had 139 participants from 21 countries, including 65 Grandmasters and 33 International Masters. The Open B had 98 players from nine countries. Mikhail Sadovski (BLR 2093) and Nail Qoshqar Bashirli (AZE 1940) shared the first place with 7,5/9 points each.